ITS HAPPENING NYC! Thanks to Gibney Dance, I will be offering 2 weeks (6 days) of classes starting NEXT WEEK! All classes will be held at Gibney 280 and only $8 each! As one show closes another one opens THIS WEEK. Over the past month, I’ve been performing Samson while simultaneously covering the new production (and US premeir) of Marnie. As sad as I am to be putting Samson on the back burner (until its revival in March), I’m thrilled to be a part of the new contemporary opera. Come see it at the Met Opera October 19 - Nov 10. I FINALLY made the move to NYC! With that move, I started my first contract with the Met Opera at Lincoln Center. For the next three months, Ill be working with choreographer Austin McCormick and director Darko Tresnjak. Samson et Dalila opens on September 24th 2018! This summer is going to be CRAZY (in an incredible way of course)!! I'm looking forward to reconnect with students and studios I have worked with in the past but also starting new relationships with dancers all over the US and Canada. I still have some availability in the cities listed above for choreography or teaching. Please reach out via email or Instagram with all booking inquiries. In less than two weeks, Keigwin + Co will be hosting a community engagement event called Dance at the Gym. This program is a week long project that combines NYC based dancers with nyc based community members. Over the course of the week Larry will create an original piece to Leonard Bernstein's iconic score from West Side Story, Dance at the Gym. I will be participating in the event as a chorographic assistant to Larry and performing in the new work at the end of the week. Creating more events to get the community involved in dance has been a greater focus for me since joining K+C and this is an incredible opportunity for me (and any other NYC based artist) to gain more experience in community outreach programing. Home from the first leg of K+C Celebrates Bernstein and what an adventure it has been! Three weeks. Six Shows. Two school shows. Three master classes. And so many good stories. This was my first full tour of my professional career and could not have asked for a better experience. The theaters and audience members made us feel so welcome and appreciated. I got to see friends and family in almost every city from LA to Denver. However, I loved getting to know the Rapid City, SD community. I didn’t think of this area as a place where dance could thrive but these people LOVE dance and appreciate it for all it is. After that particular show, I went into the lobby to thank our promoters for bringing us in and met the sweetest little boy. He looked like a mini Bruno Mars complete with stylish hat and bow tie. He asked me for my autograph and his mom told me that he wanted to be a professional dancer when he grew up too. It was one of the most fulfilling moments of my life as a performer. I want to inspire kids, especially young boys, to find a love for dance encourage them to follow their passions too. Overall this tour reminded me of how lucky I am to do what I love. I’m coming onto my 3 year anniversary as a professional and feeling grateful and inspired to continue on this journey. I’m back in NYC for a little downtime BUT it won’t last long… heading back to Houston in a couple weeks to teach again. I haven’t written an udate post in a while and so much has happened over the past month so…..
First, dancers are incredible and they are creating great work anywhere and everywhere. I’ve had this idea in my head that you can only be a successful dancer if you live in Chicago, New York, or LA. I am SOOO wrong. The work people are creating in Pittsburgh, Cincinnati, and Nashville is incredible. These dance artists are bringing dance to people who haven’t been smacked in the face with dance performances and are manifesting incredible lives for themselves. They’ve inspired me more than they know. The other thought I’ve taken away is how incredible my dance studio families are. Seeing so many familiar faces at MetDance, Studio One AZ, and Artifact Dance Project studios made the whole trip worthwhile. They were all beautiful reunions that reminded me of how far I have come as a teacher, but more so how far the students I have taught over the past decade have come. Aside from that, I am grateful for Millennium Dance Complex Las Vegas and Live Arts LA for taking a chance on me and allowing me to teach a pop up class. I have never taught there prior to this trip and they both welcomed me in as one of their own. I AM SO GRATFUL FOR ALL OF MY FRIENDS WHO OPENED UP THEIR HOMES AND SUPPORTED THIS TOUR BY COMING TO CLASS…. I can never thank you enough. Special thanks to Owen, John and Cody, Elisa and Glena, James, Mom, Marlana, Yonk, Gianni, Belle, Drew, Christie, Rachael, the Beatles Love crew, Ashley and Claire, Met toos, and everyone else who touched my heart on this trip. So whats next…?. I’m currently in NYC rehearsing for K+C Celebrates Bernstein! We leave for tour in less than a week and will be coming to California, Colorado, and South Dakota in the coming weeks! Click here for the full details and tour dates. When I was in college, the announcement board outside of the dance studios was covered in audition flyers for companies all over the country and beyond. Like many college students, I envisioned myself as part of a renowned dance ensemble, busily creating new works and touring around the globe. The vision I had of myself was so clear that I did not take much time to think of another, incredibly viable career alternative: being a freelance artist. While freelancing may not provide the stability that a full-time company can, it has a world of benefits all its own that many professional dancers will experience at some point in their career. For dance artist Brandon Coleman, the transition from full-time company dancer to freelance artist also came with a change of environment – a move from Chicago to New York City. 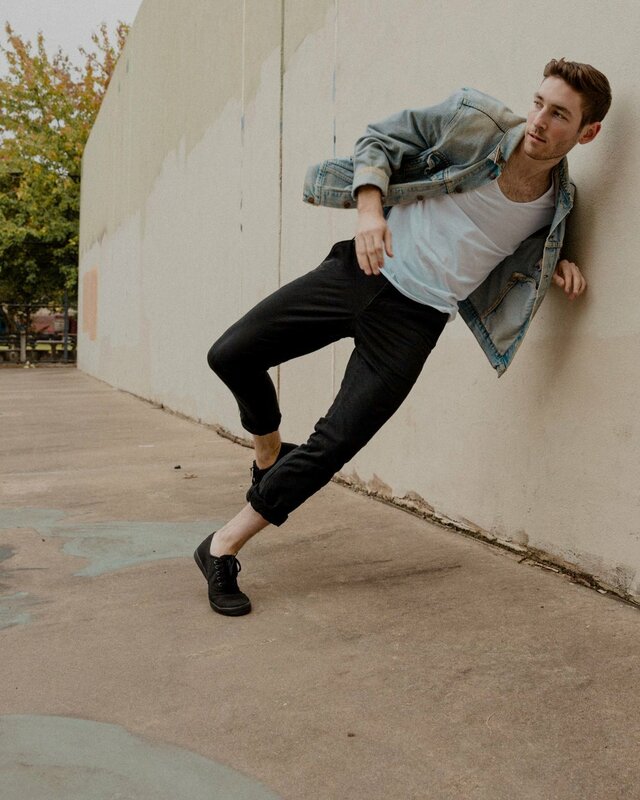 I caught up with Brandon as he and fellow former Visceral Dance Chicago dancer Owen Scarlett toured the states on a self-booked teaching tour. Read on to learn more about Brandon’s journey and how some big changes have ignited a new chapter in his career:"
Over the past four months, I've been commuting between Chicago and NYC and working with two incredible companies. Next week, I'll be performing in a self choreographed preshow solo for "Chicago Dances," presented by The Cambrians. While working with this company, I've been covering pieces by Shannon Alvis, Kevin Iega Jeff, and Ahmad Simmons. I've had to learn each dancers track and stand in for them in a few times during the rehearsal process. It's definitely been a challenge but I'm excited to be a part of this show. Head to thecambrians.com for ticket info and show times! My friend (as well as Founder/Owner of Owen Scarlett Productions) is moving to Los Angeles in January and asked me to tag along on the cross country road trip. As a part of that road trip I will be teaching a series of classes in each city we pass through Starting in Pittsburgh and ending in Los Angeles. 9 cities in 20 days! Along the way we will also be making a short documentary about our travels and the people we meet along the way. Excited for the new adventure. The end of 2017 is VERY exciting for me... for the past month I've been working on a new video series I'm calling BACKtrackDANCE. Basically its 9 short videos (all around 2minutes or less) that have all been reversed and set to music. The project has taken some planning and scheduling but the actual choreographing/structuring and editing all takes under and hour to put together. However, this project has cost me a couple $$, some MTA passes, a couple slices of pizza, a bedframe, one rain poncho, and 9 songs on iTunes. However, Ive really enjoyed working with my friends and colleagues on this project. Each video will premier on consecutive Wednesday nights between November 1 and December 27th, Look out for them!! From the BACKtrackDANCE promo. The nine NYC/Chicago based soloist that will be featured from November 1 to December 27. Since Houston, I've been traveling pretty regularly between NYC and Chicago. I became an apprentice with a project based company in Chicago called the Cambrians and continued to rehearse with Keigwin in NYC. Its been great working in Chicago because there are a handful of choreographers who the Cambrians are working with this season that I didn't get the opportunity to work with while I lived in Chicago. I also reconnected with Alberto Arias and the drag circuit while I was in town which I have really been missing. I'm not back in NYC for the next month and working on getting more established here but before I left Chicago, I worked with Brendan Fernandes again for his work Art by SnapChat at the Museum of Contemporary Art in Chicago. Ill be in NYC until November 17 and then I am heading back to Chicago for another process with the Cambrians. Living on air mattresses and out of small duffle bags isn't my idea of glamorous but I'm excited about the work I get to right now. I feel like I'm right where I need to be. Excited to be back in Houston to set a new piece on MET too! I will also be teaching and open class and METdance company class next week. Aside from my time at there, I will also be guest teaching class for the Seven Lakes Sapphires (the same High School I graduated from in 2011)! Its a full week of visiting friend, family, and old stomping grounds. Hello for Lake Placid, New York! About to finish up my first week with Keigwin +Co in upstate NY. We are currently in the process of creating two new works and restaging three existing works for our tour in 2018. One of the works we are creating is a duet between Kacie Boblitt (another UA grad and Becky's Academy of Dance Alumni) and myself. This dance world is so small! Posting MANY picture and video updates on my Instagram (@_BrandonColeman). Check it out! Feeling nothing but LOVE for you Chicago...You've provided me with a space to grow, explore, create, laugh, and learn. For that and so much more I am grateful and lucky. I'm making the move to NYC in at the end of the month BUT excited to share the Dance for Life stage with my incredible Chicago dance community on Aug. 19th. The adventure continues.... and more updates to come! Summer Teaching: Chicago, Houston, Seattle...Oh Yes! This summer has been unreal! So grateful for the studios and companies that brought me out to teach for them this summer. Started out with the Chicago School of Ballet and Hubbard Street Teen Intensive. The next week I flew to Houston and taught at METDance Youth Intensive and Pointe of Grace Dance Studio in my hometown of Katy, TX. Rounding out the Summer travel tour in Seattle working with South Sound Dance. Feeling inspired and motivated by all of these dancers. Back in Montreal for another installation of Springboard danse Montreal. After a week of workshops I am excited to be working with Maxine Doyle over the next two weeks on a new creation. Maxine is the artistic director of Punchdrunk and creator of Sleep No More in NYC and Shanghai. Excited for a summer full of dancing, teaching, and choreographing! Message me for dates and teaching info! Excited to announce that I will be working with Hubbard Street Dance Chicago over the next month! I will be working as an understudy for their upcoming Summer Series at the Harris Theater from June 8-11th. Looking forward to working with these dancers and learning some rep!